1. Upload phone numbers and variables in a CSV. 2. Create a template with #----# place holders. 3. Send out personalized text messages. 4. Save and name your template for later use. 5. Seperate templates for TTS and text. Click here to go to Hipaa website: Sign Up Now to use HIPAA! Without a doubt, we offer the best technology for voice quality and pronunciation for Text To Speech available today. You may upload additional parameters to create personal text messages and Text-To-Speech phone calls for specific numbers on your contact lists. Most of our competitors require that every message be reviewed and then approved before delivery, as well as the mandatory use of a SHORT-CODE and keyword to receive a response. This is an extremely time-consuming process and so, sending a targeted message to a small group of individuals is hardly worth the effort. However, whether you're sending a customized message to ten people or ten thousand people, Robotalker.com makes the process simple and quick! Text messages may be personalize by inserting specific information to each contact's message. Hello #name#, We are texting to remind you of your appointment with #var1# on #var2# at #var3#. Reply with YES to confirm or to reschedule your appointment call 800-234-4567. Jones Medical Clinic! 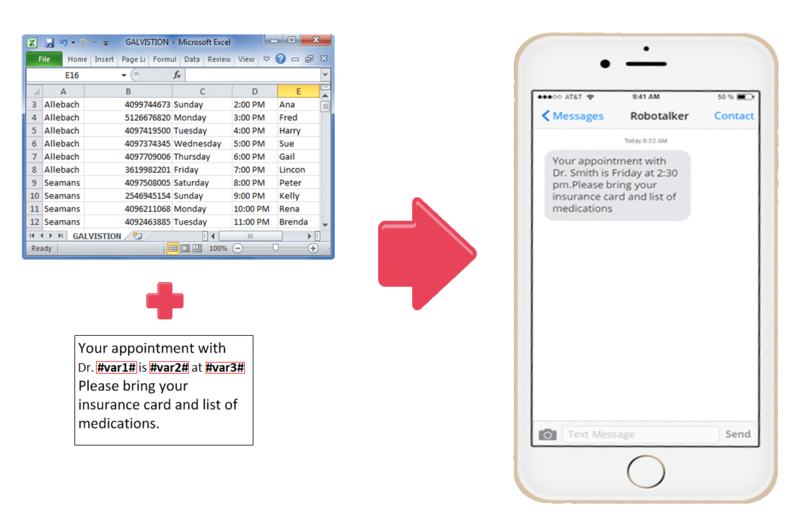 Hipaa phone calls and text messages are a secure way to send PHI using phone and text messages for appointment reminders and notifications of medical test results are ready to your patients and organizations. All data is encrypted and secure and text to speech messages are erased after delivery as well as contacts are removed from the Hipaa system AUTOMATICALLY AFTER calls and text messages are sent to ensure all information is kept private. Reports are redacted of all PHI by removing contact names, message, leaving only phone numbers and statistical results. History and reporting can be user configured to automatically erase information after a prescribed period of days so managing of lists and results is greatly simplified for the users. Hipaa system is completely secure and has its access limited to one employee for all updates and maintained. Phone and text message are fully FTC and FCC compliant with rings and opt-out out options. RoboTalker automatically detects the language of a message! Then, without any additional work for you, future phone calls and text messages will be generated in that language. It's automatic!